IBF heavyweight champ Anthony Joshua insists he is fully focused on his upcoming December 10 challenger Eric Molina, but the 17-0(17) star is also looking towards the future. Joshua makes the second defence of his belt against the dangerously determined Molina, and AJ is already planning his third and fourth defences. As fans know, the word is that Joshua, if he’s victorious against Molina, will engage in his very first super-fight next spring against former king Wladimir Klitschko. 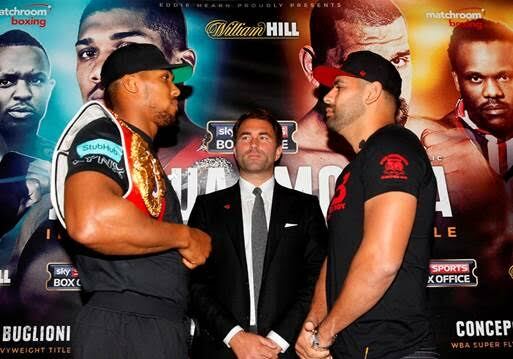 If he can win that fight – which would contest the vacant “super” WBA heavyweight title along with Joshua’s IBF belt – Joshua will likely be looked at by the majority of fans as THE best heavyweight in the world. The one fighter who might well be Joshua’s biggest threat in that department is avoided Cuban southpaw Luis Ortiz. Plenty of good judges think “King Kong” might be the best of today’s heavyweights, but Joshua says fighting him would be “no problem.” As he explained to Sky Sports, Joshua wants to fight Ortiz after he has dealt with Molina and Klitschko. If Joshua’s three-fight plan comes off, and if the 27 year-old can come through with his unbeaten record intact, his star-power, already climbing, would skyrocket. This is what the sport and the division needs, too – a young heavyweight ready and willing to fight the best each time out. Joshua-Klitschko and Joshua-Ortiz could both be huge fights/events. But, as AJ said himself, “first let’s focus on The Drummer Boy, Eric Molina.” Molina will be ruining some enormous plans if he scores the upset in one month’s time.